Home > Film Photography > Why Use Film and Not Digital? The mass adoption of digital as the format of choice has had an enormous impact on photography as both an art-form and an occupation. It is no exaggeration to suggest that it is the second most important development in photography just behind the advent of the single lens reflex. Digital has given convenience to the consumer, and has made life economically viable for the professional, but not everyone has adopted it wholeheartedly. There are still a sizeable minority of photographers who have vowed that they will never be swayed by the multitudinous attractions of digital. Instead, they have stuck with film, and many of these individuals have sworn that they will never budge. Such strength of feeling, they say, has been informed by the unique benefits which are offered only by film. Digital photography allows the user to review and cast aside images as they are being taken. While this has made printing far cheaper as there are fewer wasted frames, many film enthusiasts dislike digital for this very reason. They suggest that film has a far less ephemeral quality, that when a photographer creates a frame on a roll of film they have created something which should be kept. Indeed, it is often said that the constant deletion of digital frames has led to the devaluing of the photographic image in the eyes of the consumer and, conversely, it is probable that the majority of film photographers keep almost every negative they have ever made. It seems that there is more nostalgic importance placed in a roll of film than there is in a memory card. Digital photography has also met criticism as a result of the apparent ease with which images can be altered. There are periodic spasms of public concern about ‘doctored’ photos appearing in the press, and this is routinely blamed on digital photography. In reality this is completely nonsensical; it is just as possible to scan and alter a film frame as it is a digital file. However, the increased availability of basic touch-ups to the general photographer has raised questions over whether or not film makes you a ‘better’ photographer. It has been argued that digital allows you to make fundamental errors and then correct them afterwards, thereby reducing or removing the need to master the camera or the basic tenets of photography. However, defenders of digital suggest that things like Photoshop should be seen simply as another tool available to the photographer, an extension of the workflow. The most important, and oft-cited, reason why some individuals stand staunchly by film is, perhaps, more difficult to describe. Those who have not been swayed from analogue insist that there is something intangible about a print made from film which is simply not present in digital; an atmosphere or a feeling of gravity and importance. The way in which light interacts with film is certainly less clinical than the interpretation of colours by a digital sensor, and many suggest that this translates onto the exposure. This is particularly true of black and white, which it is generally accepted digital does not yet do as well as film. However, digital photography is developing and changing constantly, while film has stagnated. 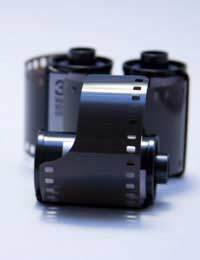 Major photographic manufacturers have stated that they will be phasing out their film ranges, and we may therefore see even further leaps made in the field of digital. Who knows, they may even win over some of the doubters.